We all love our push drills. They make perfect holes at any location in paper or leather in sizes from 1mm to 4mm. When you purchase a Japanese screw punch, it usually comes in a plastic sleeve accompanied by seven bits in tiny plastic bags. This handy little case to hold your bits is much better than a handful of tiny plastic bags. It protects and stores 7 bits, each in its own little hole. 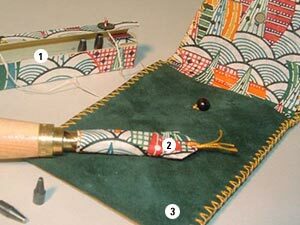 The box is covered with Japanese paper and has a cord and button closure. This pouch will hold the bit case and the punch in one neat little package. The pouch is made from leather or kimono fabric lined with Japanese paper. It fastens with a vintage button or bead. Order both the bit case and pouch and receive a cap (2) to protect the collet on your screw punch! Bit Case - Patterns and colors vary. Let us select one for you. Storage Pouch - Patterns and colors vary. Let us select one for you. Bit Case & Storage Pouch Set- Includes a free screw puch cap!